I often enjoy Gary Antonick's NumberPlay column (each Monday). I especially like logic puzzles, so solving this one should be fun. Polar curves in nature... I wonder if the math might help explain the shape? This "which would you pick" question is a great intro for expected value for statistics. GSWP describes lots of different kinds of critical thinking. Fawn Nguyen is brilliant. This is a place-value puzzle that got her whole class thinking hard. A good article on Steven Strogatz in the classroom, which mentions some very interesting free curriculum. Hmm, I wonder if my son would try this maze puzzle, called Ogleboro City ... I'll print it out and see. These gifs are making the rounds on Facebook. 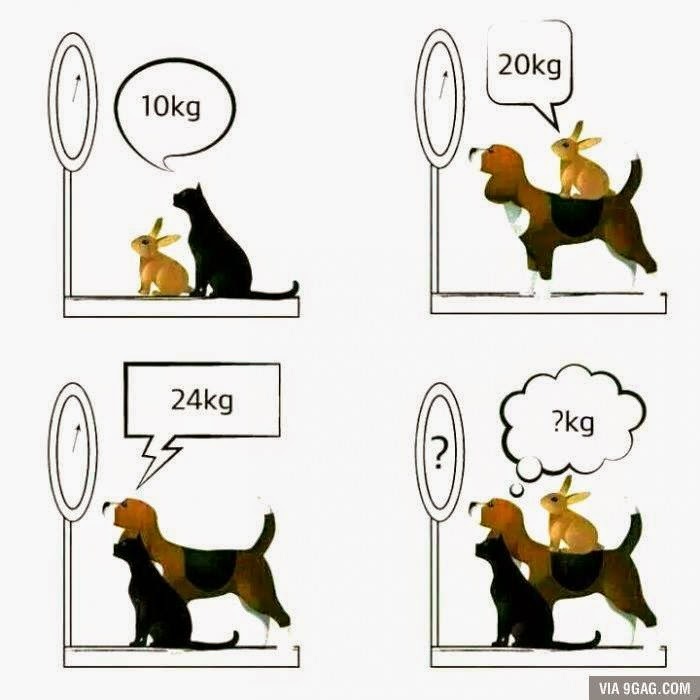 Here's a much easier puzzle from 9gag (found on Facebook). And I'll end with a request. Would someone please teach me to use a slide rule? I know it's a totally archaic skill, but I think it would help me explain logs to my students.